Houston, Texas - Houston Zoo guests may catch a glimpse of something odd on the back of one of the giant anteaters, but it's supposed to be there - it's a new baby. Rio, a two-week-old giant anteater pup, can be seen riding atop mom at the zoo. 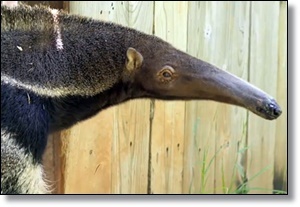 The anteater was born on September 3 to parents Olive and Pablo. The zoo explains giant anteaters spend the first few weeks of life clinging to their mothers and will typically hitch a ride on mom's back for almost 12 months. The zoo says Olive has been very attentive to Rio, carefully nursing and transporting the pup around their habitat. Zookeepers are waiting for Rio to grow a bit and bond with its mom before determining the baby anteater's gender.